Weakness in Copper persists, and it shows the risks to optimistic global growth and inflation expectations. But something else is happening in gold and copper apart from global slowdown and US dollar strength. One of the ways in which Chinese firms have been trying to raise funds as credit growth slowed down and conditions hardened was using copper-backed financing. Gold-backed loans have also become very popular. So popular that, despite clarity or official data, analysts estimates range from 250,000 tonnes to 1 million tonnes of copper alone that are being used as collateral. Chinese firms could have locked up as much as 1,000 tonnes of gold in financing deals, according to the World Gold Council. The widespread use of commodities to raise financing includes gold and iron ore, where up to 20% of stockpiles have been estimated to be tied to high-risk, cheap financing. This giant carry trade worked while the Yuan rose, and commodity prices soared. 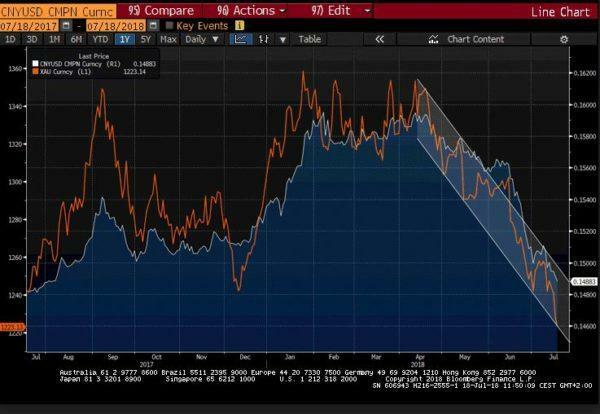 Now, one of the reasons for the recent sell-off is the combination of Yuan weakness vs the US dollar, Chinese growth estimates being revised down and commodities prices falling in tandem. The risk of a domino effect is not dissimilar to other cases in history where risky loans have been tied to an underlying asset that rapidly loses value, from the 90s “Yen-denominated mortgages” that triggered huge losses in European markets as the Japanese currency revalued and repayments became more expensive, to the asset-backed loans in housing and oil just before the collapse. The difference this time is that the amounts are enormous and certainly much less manageable. The combination of weaker demand growth and strength in the US dollar is making margin calls jump and shows that these alleged “safe assets”, such as copper and gold, have become much riskier as the number of non-performing loans rise and the repayment capacity diminishes, triggering a significant sell-off in the underlying commodity. In essence, the sell-off in the Yuan, gold and copper are one and the same. This signals a rising capital flights and a much higher non-performing loan ratio than the surprisingly low official data. We are witnessing the unwinding of bets supported by excessive complacency about China, global growth and risk. In the case of gold, it is showing no signal of being a safe haven asset or inflation hedge because of the abnormal amount of gold-backed loans in the riskiest sectors. Gold or copper-backed loans are rarely tied to safe and sound loans, but a way to receive low rates for the riskiest projects in an economy that is clearly in a slowdown mode. Many of the lowest-quality loans in China use copper or gold as collateral, up to 30% according to HSBC, as it is an indicator of industrial activity and closely linked to Chinese growth. When the market begins to question the debt repayment capacity of many Chinese companies, margin calls are triggered and copper falls with it. Chile accounts for 34% of the world’s copper production, approximately 19% of the revenues for the country. The USA is the fourth largest copper producer in the world, after Chile, Peru and China, and Australia is fifth. All these countries are producing at peak levels, and a small decrease of 3.5% year-on-year has failed to address the surplus. In terms of demand, China accounts for 50%, followed by Europe 17%, other Asia 15%, U.S. 8%, Japan 5%. The rest are minor consumers. Risks to demand estimates for refined copper in China mean that overcapacity increases. A risk that is also enhanced by the fact that current demand growth estimates are factoring a stronger US economy. The decline in gold, copper and the Yuan vs the US dollar also show how global investors were aggressively betting on a “weal US dollar forever” carry trade. The world believes the hype of “synchronised growth”. Ignores the risk of synchronised debt. Takes aggressive loans backed by commodities to finance the riskiest projects. Buys massive exposure to emerging markets and China predicated on a continuation of inflows of cheap dollars into these markets. 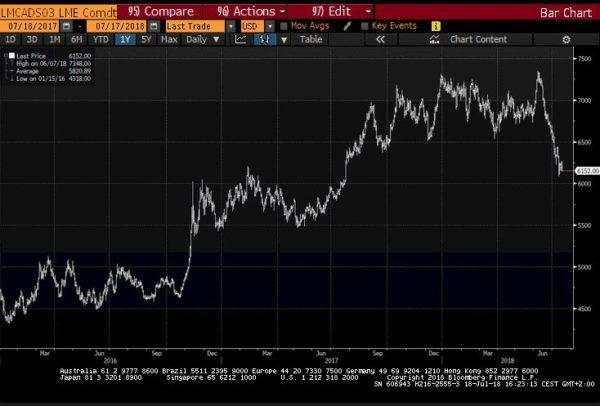 The US dollar strengthens a bit and rates rise moderately… and all hell breaks loose. Welcome to the bubble. A bubble that does not need a crisis to explode, just a small downward revision of overoptimistic estimates, and leveraged bets start to go wrong. Even if we put in question the extent of the commodity-backed financing risk, there is one thing we simply cannot ignore. Net length in the above mentioned currency and commodities was financed by a US dollar carry trade gone wrong. And the pain may be far from over. What is the biggest risk? We do not have official data that allows us to understand the extent of the problem and the likelihood of contagion. The second biggest risk is that investors have been increasing exposure to the most cyclical assets and commodities in recent weeks, showing that markets are dangerously betting on the Fed not doing what it has announced it will do, added to an even more dangerous bet which is that China will grow faster than the current estimates and solve its imbalances rapidly. Can this trigger a domino of bankruptcies like the burst of the oil bubble? We do not know yet. What we do know is that we will never learn from the previous mistakes.